Luxury Plumbing Fixtures Market size was worth over USD 19 Billion in 2016 and will witness CAGR over 4.5% up to 2024. 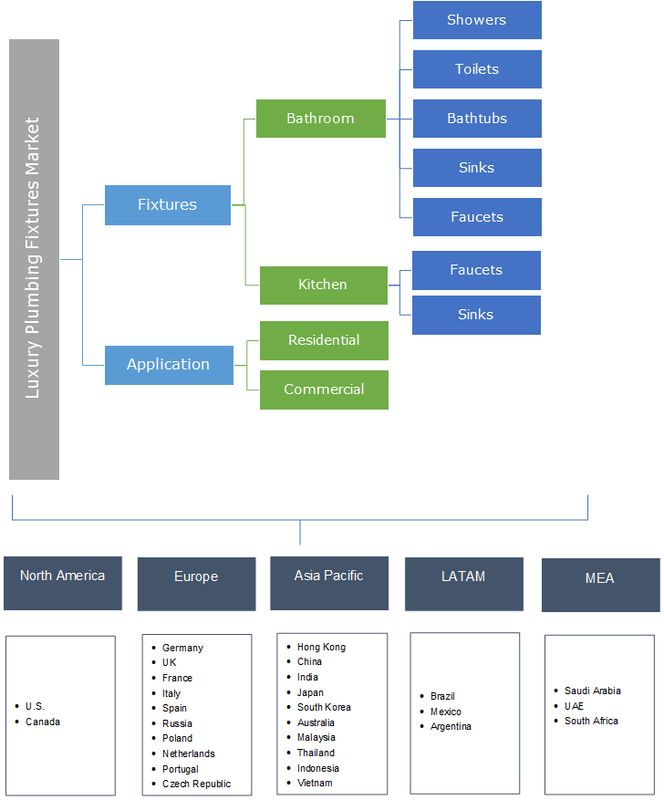 Increasing customers focus towards luxury housing and smart homes to enhance lifestyle is the key factor driving luxury plumbing fixtures market growth. Rising consumer spending on home renovations owing to increase in affordability will significantly influence market expansion. Upsurge in urbanisation coupled with the improved economic condition will stimulate product penetration. According to the United Nations, around 54% of the global population lived in urban areas in 2014 and another 2.5 billion will be added by 2050. Advancements in the plumbing technologies including low flow faucets & sensors and dual flush toilets will support luxury plumbing fixtures market demand. The U.S. Environmental Protection Agency formulates that the conventional flush systems consuming six gallons of water per flush should be replaced with WaterSense labelled high-efficient toilets consuming only 1.28 gallons or less. Georgia, California, Texas, and the recent Colorado have matched the criteria of EPA WaterSense flow rate in making their state proficiency standards. These new models provide superior performance than conventional toilets thereby, conserving water by around 20-60%. Rising popularity of water-efficient products in both residential and commercial buildings will enhance product demand. Enhanced design trends and scope of customization will further attract the customers for the purchase of high end bathroom and kitchen products. Renovations supported by green building regulations will propel the industry size. Currently, manufacturers are focusing on production of electronic-based products, which is expected to positively enhance the luxury plumbing fixtures market growth. Financial incentives and state-level mandates will also boost demand for the products. For instance, Connecticut established the foremost water efficiency guidelines in 1989. The legislation sets the maximum flow rates for fixtures that are sold, manufactured, and installed in the state after 1990 and the legislation is still followed for products’ water efficiency. High as well as fluctuating raw materials cost will impact luxury plumbing fixtures market price trend. Time taking certification and standardization process to ensure safety and security is the major challenge for the industry. Moreover, stringent regulations imposed on the quality of material such as lead, tin, and nickel to be used in the bathroom as well as kitchen fixtures are expected to limit product range. Bathroom luxury plumbing fixtures market was valued over USD 15 billion in 2016. Growing prominence of touch free bathrooms and toilets for comfort and aesthetics will boost the industry demand. Bath tubs are the major fixtures driving the segment growth. Increasing demand for spa and rejuvenation centres is the major factor supporting bathtubs demand. Advancements in toilets such as heated seats and sensor operated valves will propel the luxury plumbing fixtures market. Increasing demand for compact and easy to use products will support the market growth in the forecast period. Innovation in shower heads and panels for effective splash of water without wastage will support the product penetration providing lucrative opportunity for industry growth. Kitchen luxury plumbing fixtures market accounted for more than 15% of overall industry share in 2016. Increasing trend for smart homes with cleaning area of kitchenware will generate the demand for efficient fixtures. Faucets are the key contributing applications in this segment. Rising preference for efficient and aesthetically appealing faucet to provide long life is driving the industry growth. Adjustable faucets for supply of optimum amount of water for various purpose will enhance the segment growth. Rising customer need to reduce utility bills by water efficient products will stimulate product demand. Residential application was valued over USD 10 billion in 2016 owing to the real estate industry expansion. Rising population coupled with increased construction and remodelling activities specifically in the emerging economies will fuel the market growth. Rising urbanization and inclination towards new designs and better technology in homes will drive the segment growth. Easy to install and capability to occupy limited space owing to exhausting residential construction areas will significantly drive the luxury plumbing fixtures market size. Commercial segment accounted for more than 35.5% of overall industry share in 2016. Rising construction of bathroom-intensive commercial structures such as offices, educational facilities, hospitals and hotels will drive the industry expansion. Hospitality sectors expansion owing to increasing leisure travel and tourism will enhance the product demand in commercial sector. Increased use of sensor operated faucets in the malls and showrooms will create potential outlook for luxury plumbing fixtures market growth. Growing trends of hotels, resorts, casinos and other leisure-related businesses will drive the industry expansion. North America luxury plumbing fixtures market will be valued over USD 7 billion by 2024. Rapid recovery in construction expenditures will drive the regional demand. Increasing drought-like situations in various states including California generating need for water efficient products will fuel the market growth. Outdated water distribution system and sewer system is compelling the builders to find alternative ways of conserving water. According to the Environmental Protection Agency in the U.S., bathrooms consume about 50% of the water used for indoor household purposes generating the need for water efficient products. APAC luxury plumbing fixtures market accounted for more than 25% of overall industry share in 2016. High investment in infrastructure facilities along with rise in disposable income is expected to fuel the industry growth. Rise in bathroom and kitchen remodelling projects among middle class population will support the product demand in the region. Economical products availability in India and China owing to the country’s recognition as manufacturing hub will provide numerous opportunities for industry expansion. According to a study, China is the largest consumer industry for luxury goods, responsible for 30% of the global spend. Rise in luxury expenditure of customers in the region will drive the industry size. Luxury plumbing fixtures market share is highly fragmented due to low entry barriers in the industry. Shifting conventional plumbing fixtures manufactures focus towards high-end fixtures industry are key factors making industry competitive in nature. Cera Sanitaryware Limited, Bradley Corporation, Delta, Gerber, Kohler, Moen, Little Giant, Grohe, American Standard, are among the major industry players. Other industry participants include Sterling Faucet Company, Natphil, The Noble Corporation, Matco-Norca, Fiberez Bathware and Toto. Product innovation and design development to engage customers interest are among the key strategies. Sensor-operated fixtures are another major aspect focussed by the players to provide personal-comfort, performance, germ-free bathing and aesthetics. In May 2011, Kohler Numi launched advanced toilet fixtures including heated seat and foot warmer, built-in bidet functionality and deodorizer, dual-flush system with 1.9 liters per flush, and an automatic lid that opens and closes using a sensor. Plumbing fixtures are components installed in residential and commercial buildings to enable effective distribution and draining of water from the building. Premium products used for improvement of efficiency and aesthetic appeal are included in high-end luxury plumbing fixtures market. Bathroom fixtures are the fittings used for water outlet and draining purposes. These products are mostly used as water outlet are showers and faucets and that are used for draining include sinks, bathtubs and toilets. Kitchen fixtures are installed for delivery and draining of water in the kitchen areas. Improvisation in material used for manufacture coupled with the enhanced technology will drive the luxury plumbing fixtures market growth.